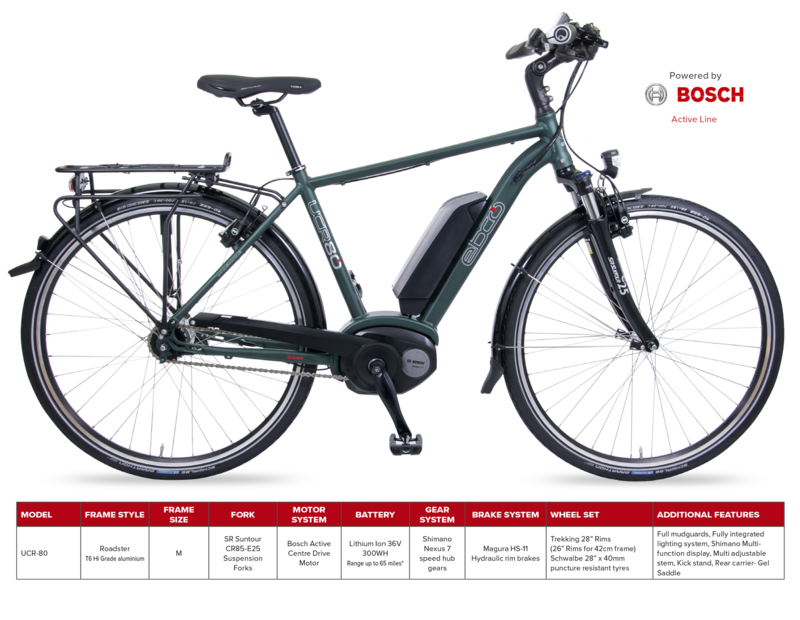 Ideal for the leisure rider or urban transport the UCR-80 is a premium e-bike featuring the Bosch Active Mid Motor system teamed with Nexus 7 internal hub gear system, Magura HS-11 hydraulic rim brakes and a high level finishing kit matched to a lithium ion 400wh battery giving a range of up to 75 miles and a sophisticated riding experience. Available in a traditional Roadster frame style with a comfortable upright riding position. Size:-M. Finished in Matt Green. Urban City Traditional roadster frame built in T6 high grade aluminium finished in Matt Racing Green and with Suntour CR85-E25 suspension forks giving a smooth comfortable ride.